Dr. Martin Price, co-founder of ECHO, first met Dr. Frank Martin when the latter was director of the US Department of Agriculture’s Research Station in Mayaguez, Puerto Rico. When Dr. Price began at ECHO, one of the first things he did was buy a plane ticket to visit Dr. Martin in Puerto Rico. Dr. Frank Martin is best known for his research on the sweet potato and other tropical root crops, but his knowledge is much broader than that. He has written on many topics, both for ECHO and for numerous technical refereed journals in the scientific community. Content for this publication is derived primarily from a video by Dr. Frank Martin; however, it is supplemented with information gleaned from a number of other sources. References for these sources are listed in the references section. Citations for each reference include the URL address for those interested in accessing additional information on the Internet. Tropical root and tuber crops are consumed as staples in parts of the tropics and should be considered for their potential to produce impressive yields in small spaces. They provide valuable options for producing food under challenging growing conditions. Cassava and taro, for instance, are excellent choices for drought-prone or swampy areas, respectively. In this document, tropical root crops are compared both to enable people to recognize and appreciate them as well as to familiarize readers with their strengths and weaknesses in different tropical environments. Though tropical root crops initially seem to be very similar in their uses, they exhibit important differences. To start with, consider the entire group of roots and tubers in relation to other groups of plants. Approximately 30,000 edible plant species have been documented (FAO 1998). Yet 90% of the world’s food supply depends on only a small number of crops— 7 to 130 depending on how the data are analyzed (FAO 1998; Prescott and Prescott 1990). All edible plants can be classified into a few categories based on use. The first and most important category of edible plants is the cereal grains, including wheat, rice, and corn. These three crops provide over half of the world’s dietary energy (calories). The cereal grains play a very important part in the diet. They contribute a lot of food energy in the form of carbohydrates, and are a good source of the B vitamins (e.g., thiamine, riboflavin, niacin, and folic acid). Grain legumes constitute the next most important group. Grain legumes produce an edible seed, and include beans and their relatives such as soybeans. In these crops the protein content is much higher. The carbohydrate content is also fair, but not as high as in cereal grains. Some grain legumes have an oil content that is another important source of calories. The B vitamin content is very good, and sometimes the vitamin E content is also fair. Grain legumes are body building foods that can be eaten as a substitute for meat when they are part of a balanced diet. Vegetables are the next major category. Edible leaves are an important type of vegetable, and are the most abundant in the tropics. Leaves of at least 4,000 plant species are eaten. Of all the vegetables and fruits, leafy vegetables are probably the best source of vitamins A and C, protein, and minerals. Roots and tubers are also classified as vegetables. Many people despise these crops and view them as “poor man’s crops,” but their value as a food crop extends to all people. Roots and tubers mainly contribute carbohydrates, starches and some sugars to the diet, but they all contain other nutrients. Often these other nutrients make up for their otherwise relatively poor nutritional status. As an energy food, they provide much-needed calories for carrying out farm-related tasks such as planting and weeding; at least 4000 kilocalories are needed for a full day of diligent farm work (EDN 121). Additionally, the leaves of some of these crops, as explained later in this document, are edible and provide protein, minerals and vitamins (Hahn 1984). See FAO 1990 for detailed information on the nutritional quality of tropical root and tuber crops. Roots and tubers look a great deal alike and can be difficult to distinguish. However, from a botanical standpoint, the distinction is simple. Even though most roots and tubers develop below the ground, they differ in terms of where they originate. The root is an enlarged storage organ that comes from root tissue, while the tuber is an enlarged storage organ that comes from stem tissue. In this document, roots and tubers are classified together because of their similar uses, regardless of the botanical distinction. Both roots and tubers are sources of and reservoirs of energy (mostly in the form of starch) for the growth of the plant itself. They are most commonly found in plants that have to go through a long dry season. Out of two or three thousand existing edible roots and tubers, only about 25 species are considered to be of primary importance. Examples include potato, sweet potato, cassava, yams and aroids. The significance of these varies between regions. Cassava, for example, only provides 1.6% of the world’s plant-based calories; however, it accounts for over half of plant-derived calories in Central Africa (FAO 1998). Each of these five aforementioned important root and tuber crops will be discussed below, with information given on life cycles, propagation and storage, leaf usage, and food processing. Figure 1: Potato tuber. Photo by ECHO staff. It might seem a little out of place to talk about the potato (Fig. 1) among tropical root crops, and yet the potato is a tropical crop. It originated in the cool tropical highlands. It has since been spread to other parts of the world, where it is now even more important than in the tropics. Nonetheless, some major producers of the potato are in the tropics. In the highlands of both Peru and Ecuador, potatoes are a staple food and are produced for the whole country. The potato plant grows very rapidly, and has the shortest growing season of the roots and tubers described in this document. Some potatoes can be produced in only two months. However, potatoes are not easy to grow in the tropics because they have many disease and insect problems; this is especially a problem for a crop which is propagated through its roots. Special seed potatoes can be produced under conditions that keep them relatively free from viruses and insect pests, but they are difficult to obtain and grow in the tropics. Where seed potatoes are produced in the tropics, they are grown in the most elevated and cool portions where potatoes can be grown. Most countries in the tropics do not produce their own seed potatoes; instead, they import them from places such as Holland. Potatoes can be stored for four to five months if they are kept in cool, dark, humid and ventilated conditions (Hunt 1985). The leaves of the potato contain a poison called solanine. They should not be eaten. Starch can be obtained by grinding potatoes, placing that ground material in water, and agitating it. The starch will separate from the other cellular material and settle to the bottom of the container, after which the water (with other materials from the cells) can be poured off. A very clean starch can be obtained by repeating this process several times and allowing the starch to settle out each time. Flour can be made from the entire potato tuber. To make flour, either cook, mash, and dry the material; shred, blanch and then dry; or just grind and dry without any cooking. Potato flour can be made industrially; usually an antioxidant substance is added to the mixture to prevent oxidation and the production of off colors. Cassava can be grown almost anywhere in the tropics, but is very frost-sensitive. Cassava can survive in dry conditions for a very long period of time and still go on to produce a good crop. It can be an extremely heavy yielder. Figure 2: Cassava stem cutting. Photo by Tim Motis. 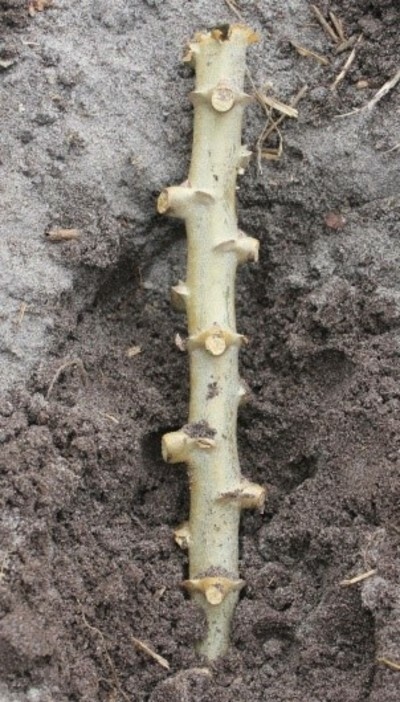 Cassava is propagated from a piece of the stem (Fig. 2), about a foot long and fairly thick. The cassava stick is either buried in the soil or placed in the soil at an angle, with about a third above the level of the soil. The stem is resilient and keeps well. Even under relatively poor conditions, the stem will eventually produce roots, and some of those roots will produce cassava. Cassava takes a long time to mature. A few varieties can be harvested in eight months, but harvest after a year is not considered excessive. Some varieties are harvested at a full year and a half. Cassava is uniquely flexible because it can remain in the soil in a living condition for a very long period of time and can then still be used as food. However, once harvested, it has a very poor storage life; it begins to deteriorate about a week after it is harvested, so it needs to be eaten or processed very quickly. Drying, covering with sawdust and even freezing are ways to lengthen the time that the roots can be preserved (South Pacific Commission 1995). The cassava leaf is always lobed, having anywhere from 3 to 13 lobes (Fig. 3). It is typical to have knotty nodes on the stem where old leaves have fallen away. The leaves are frequently eaten, especially the tender stem tips and young leaves. Figure 3: Cassava foliage (top) and roots (bottom). Photos by ECHO staff. When the nutritional characteristics of cassava leaves were first measured, they were found to be very high in protein. They seemed like a very good food for people who were not getting enough protein. Since then, the cassava leaf has been shown to have other substances called phenolic compounds that combine with the protein; when the leaves are chewed, the protein tends to join with these phenolic compounds and a good deal of the protein becomes inaccessible. This means the cassava leaf is not as nutritionally desirable as it might seem. However, cassava leaves are produced under conditions of drought, making them available as a vegetable under circumstances in which people may not have other options. All cassavas contain compounds that are a bound form of hydrogen cyanide, but in the leaves these are released relatively quickly by cooking. Unless you were going to eat leaves raw, the presence of these hydrocyanic glycosides is not a serious problem. Cassava roots are long and narrow. They can grow to 3 feet (91 cm) or more in length, and can get as big as 6 inches (15 cm) in diameter. A marketable size is 1 ½ to 2 ½ inches (4 to 6 cm) in diameter and 1 to 2 feet (30 to 61 cm) long. Some cassava roots contain significant amounts of hydrocyanic acid. These are called bitter cassava. Cassava roots with relatively small amounts of hydrocyanic acid are considered not harmful and are referred to as sweet cassava. In reality, the distinction is not so simple. Cassava varieties have varying amounts of hydrocyanic acid, along a gradient. Cassava varieties with high amounts of hydrocyanic acid are quite poisonous and need special treatment, often including a process of fermentation, before being eaten. With “sweet” varieties, regular cooking will reduce the hydrocyanic acid to a safe level. A common way to cook sweet cassava is to peel and wash the roots, cut them into pieces and then boil them in water (South Pacific Commission 1995 contains more information on cooking cassava). Cassava can be used to make flour or starch, a good use for the bitter varieties as they tend to be more pest and mosaic virus resistant than the sweet varieties. The roots are fermented before being dried and then ground to make flour used for bread and fufu. To make starch, fermented roots are grated, mixed with water, strained and then left for the starch to settle out. The starch can then be used to make tapioca. In one method, moist starch is dried over a fire on top of a metal sheet; as this drying occurs, the small grains of starch tend to accumulate and stick to each other, making little balls of tapioca. In another method, moist starch is rolled out, cut into pieces and rolled into tapioca balls. The sweet potato is a tremendous producer and has great potential in the tropics. However, of the roots and tubers, sweet potatoes are probably the most sensitive to insect pests, including some that are very specific to the sweet potato itself. The most serious of these is the sweet potato weevil, which is found throughout the world and has limited the potential of the sweet potato. Sweet potato is often rotated with rice and sorghum; only growing sweet potato once every five years in a field can help to break the life cycle of the weevil (Infonet-Biovision 2012). Figure 4: Sweet potato cutting (also known as a ‘slip’) with leaves attached (top) and then trimmed (bottom) and placed in a shallow trench prior to covering with soil. Photos by Tim Motis. In the tropics, the sweet potato is normally propagated from cuttings (Fig. 4). Plants can be spaced 30 to 38 cm in rows 1 m apart. Once a plant is well-established, you can propagate from it and then re-propagate from the new cuttings. However, it can be difficult to maintain cuttings throughout the entire year. Where the rainy season is relatively short and the dry season long, a farmer will often find that when he wants to plant sweet potatoes, he cannot get enough cuttings for his planting. Ideally sweet potato plants should be maintained under good conditions during the entire year; this is good in theory but not possible for many small farmers who do not have the ability to adequately irrigate. On average, it takes the sweet potato about 4 ½ months to reach harvestable size. However, some varieties can be harvested in as little as three months. There are also places in the world, such as the highlands of Papua New Guinea, where sweet potatoes are grown for nine or ten months (due to either the variety or the climate). In contrast to some of the other roots and tubers, sweet potatoes never reach true maturity. As soon as you dig up the tuber, you can replant it and it will begin producing sprouts that, once they have leaves and roots, can be broken off of the tuber and planted. Once sweet potato has been harvested, the tubers have a very short normal storage life. In the tropics, sweet potato cannot generally be stored for more than three to four months (FAO 1998b, which contains information on ideal storage practices for sweet potato and other roots and tubers). The sweet potato has a simple leaf which is often lobed but may be entire (that is, without the lobing) (Fig. 5). Many varieties have intermediate lobing. 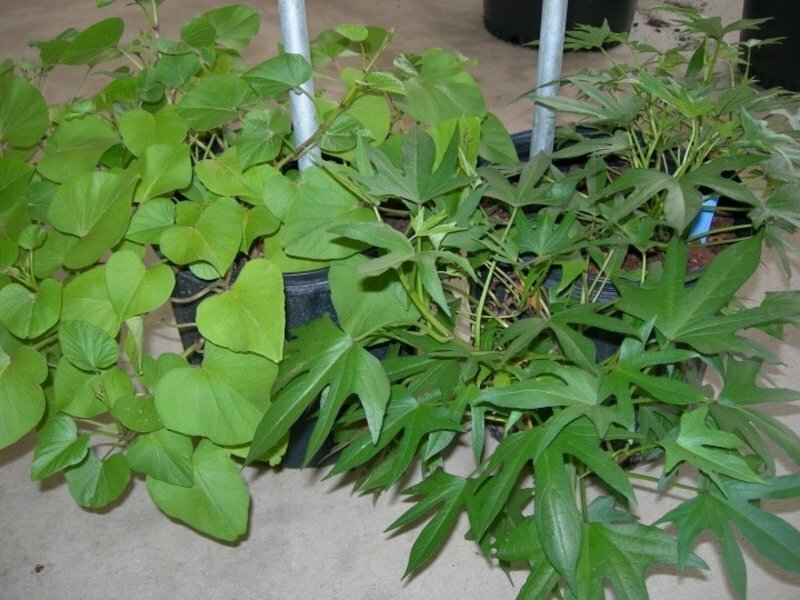 Figure 5: Sweet potato foliage with variation in leaf shape. Photo by Larry Yarger. In some countries of the world, sweet potato leaves are an important vegetable, extending the usefulness of the plant. Only the tender tip and young leaves should be eaten; in a rapidly growing cutting, you could harvest a 4 or 5 inch (10 to 13 cm) piece from the tip. The sweet potato plant family contains a higher-than-normal amount of oxalic acid. Oxalic acid is a concern because it combines with free calcium to make the compound calcium oxalate. That compound is not soluble, and calcium will be lost to the body as calcium oxalate is excreted. When you harvest just the tender tips, you avoid the leaves that have the highest concentration of oxalic acid. Even so, do not make sweet potato leaves your sole source of food. The sweet potato tuber (Fig. 6) is used in ways you probably already know. The white ones are used just like a potato. Orange-fleshed sweet potatoes are often used in dessert foods, including cupcakes and candied sweet potatoes. Figure 6: Sweet potato tubers. Photo by ECHO intern, Emily Iverson. Sweet potato tubers do not contain any poisonous material of great consequence to the human diet, especially since they are almost always cooked before being eaten. When eaten raw, however, sweet potato tubers retain trypsin inhibitors, which inhibit the use of enzymes that digest meat. In addition, sweet potatoes that are attacked by insects and disease have some special problems. When you cut a sweet potato that has some interior insect damage, after 10 or 15 minutes you will find that the areas around the insect damage have darkened, and the darkening will increase with time. (A healthy cut sweet potato will darken very little.) This darkening of the flesh indicates that wound-protecting substances have diffused out from an area that was previously damaged by an insect. Most of the substances are not harmful—just normal phenolic substances that are subjected to oxidation when exposed to the air. However, another class of very poisonous terpenoid-like materials is produced in the sweet potato in response to insect damage. For this reason, humans and animals should avoid eating sweet potatoes that are heavily damaged by insects. If you are very hungry and you have only sweet potatoes that are damaged by insects, carefully and generously cut away the insect-damaged tissue, including some of what looks like good tissue, so that you avoid the poisonous compounds. Sweet potatoes can be used to make flour, but not very easily. The sweet potato tuber contains a high concentration of very reactive sugars. These sugars will join with the amino acids and protein to create substances that are very disagreeable; they are brownish or blackish in color, and have a very bad odor and taste. More than one person has been very disappointed to make beautiful sweet potato flour and, on cooking with it, to find their product completely ruined. Sweet potatoes are peeled and trimmed to remove the skin and any injured or unwanted portion. The sweet potatoes are shredded (not ground) as fine as possible, and the shreds are loaded onto trays about 1.5 inches (4 cm) thick. The trays are then placed in a breezy location in shade where moving air can penetrate. They are left overnight for 16 to 20 hours. The trays are then placed in direct sunlight in a breezy location for as long as necessary. Alternatively, this final drying step can be done in an oven at very low temperature. Whether they are dried in sun or in an oven, the shreds should be spread thinly on the trays for uniform drying. All the shreds must be brittle before drying is terminated. The dried shreds are packed in plastic bags or containers. They may also be milled, about two cups at a time, in a household blender. The flour can be sieved, if desired, and the rough fraction can be remilled. The finished flour is ready for use and should be stored in airtight containers. More information can be found in a short paper entitled Making Sweet Potato Chips and Flour (Aisia 2010). Although cassava is grown more widely than yams, yams have the potential to out yield cassava. Yams prefer a long wet season with about 1500 mm rainfall (Tindall 1983); however, they grow in a wide range of climates and are considerably drought tolerant. Yam provides very good food that is appreciated by almost everybody that tries it (in contrast to sweet potatoes, which some people dislike from the start). While there is only one species of sweet potato, one species of cassava, and several of potato, there are 60 species of edible yams. Of these, ten are grown as crop plants. Diascorea bulbifera (air potato), D. alata (water yam, winged yam and purple yam), D. rotundata (white yam), and D. cayenensis (yellow yam) are grown as major crops. The potential of D. bulbifera is undoubtedly in the home garden, where its health and vigor commend it for growth…Because of their potentially high yields, [the vines] should be magnificent producers of edible flesh and starch. 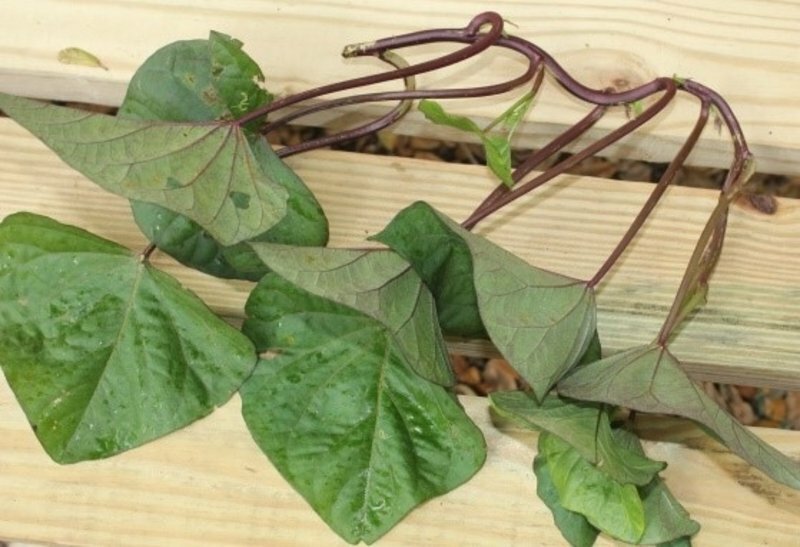 CAUTION: Unfortunately, because of its attractive, heart-shaped leaves, wild forms of air potato—with poisonous tubers—have been introduced into the southern United States and elsewhere. The rapidly growing vines of these wild forms crowd out native vegetation, smothering entire trees. For information on distinguishing the difference between wild and domesticated forms of air potato, consult the above-mentioned publication, Tropical Yams and Their Potential, Part 2 (Martin 1974). Water yam (D. alata) is often what people are talking about when referring to “yams.” Unlike the round stems of air potato, the water yam has square stems with ridges described as wings (Fig. 7); hence it is often referred to as “winged yam.” Being very widespread, with many varieties grown, it is the most important of the cultivated species of yams. The tubers can grow to be very large, reaching 9 kg or more, with satisfactory yields ranging from 40-50 tonnes/ha. Some varieties produce purple-colored tubers and/or aerial tubers (reaching 5 X 10 cm in size; Toensmeier 2007). As with those underground, aerial tubers are edible and can give rise to new plants. See Tropical Yams and Their Potential, Part 3 (Martin 1976) for much more information. 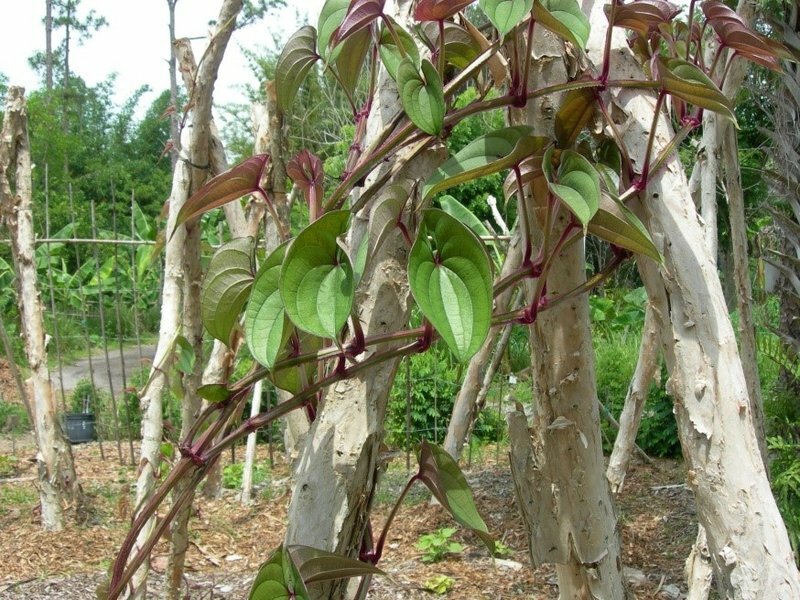 Figure 7: Photo of Diascoria alata (purple variety called ‘Ube’) vine on trellis (top) and tuber (bottom). Note the vine’s frilled ridges along the square stems. Photos by Larry Yarger (top) and Tim Motis (bottom). White (D. rotundata) and yellow (D. cayenensis) yams originated in West Africa, where they are often found in forests, with the vines climbing trees in search of sunlight. As their common names suggest, the flesh of D. rotundata and D. cayenensis tubers are white and yellow, respectively. Unlike water yam, there is little variation in the shape of the tubers; most are cylindrical and unbranched. Aerial tubers are rare. White and water yams are often grown together. However, the leaves of the white and yellow yams are not as soft/tender as those of the water yam and are therefore less apt to wilt and better suited than water yam to areas where the rainy season is short and unpredictable (Martin 1977). According to Tindall (1983), white yam grows better in light, sandy soils and requires a longer growing season than the water yam. White yam tubers can be harvested 200 to 280 days after planting; yellow yam tubers mature later, at 280 to 350 days after planting. By growing a mix of white and yellow yam cultivars, the harvest season can be lengthened. The yam is a very important crop in the tropics. However, there is one characteristic that makes it more difficult to grow than other root and tuber crops: the yam plant’s life cycle is rather inflexibly connected to the yearly cycle. During the short days of the year (i.e. days with less than 12 hours of sunlight) a yam plant begins to produce the tuber and the vegetation begins to die back. Shorter days in the tropics often coincide with the dry season, especially in areas closer to the tropics of Cancer (23.5° North latitude) and Capricorn (23.5° South latitude). During the dry season, the life of the plant is maintained in the tuber. Some yams are so exact in their life cycle that a farmer cannot change it, even by a week or two. Primarily, yams are propagated using pieces of existing tubers (called setts) (Fig. 8), cut in much the same way that potatoes are cut. The largest underground tubers are the best sources of propagation material. 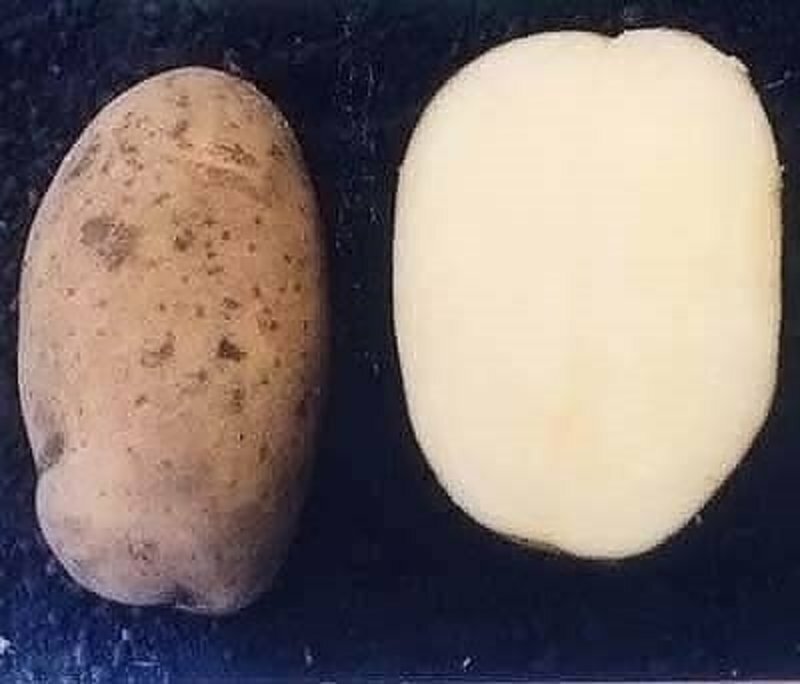 Smaller tubers are more likely to have been adversely affected by pathogens and to pass along a disease problem to a subsequent crop. If aerial tubers are used for planting, select the largest ones, as aerial tubers are generally smaller and do not produce as vigorous of seedlings as large underground tubers. Yams can also be propagated from relatively new cuttings, but success varies from variety to variety. 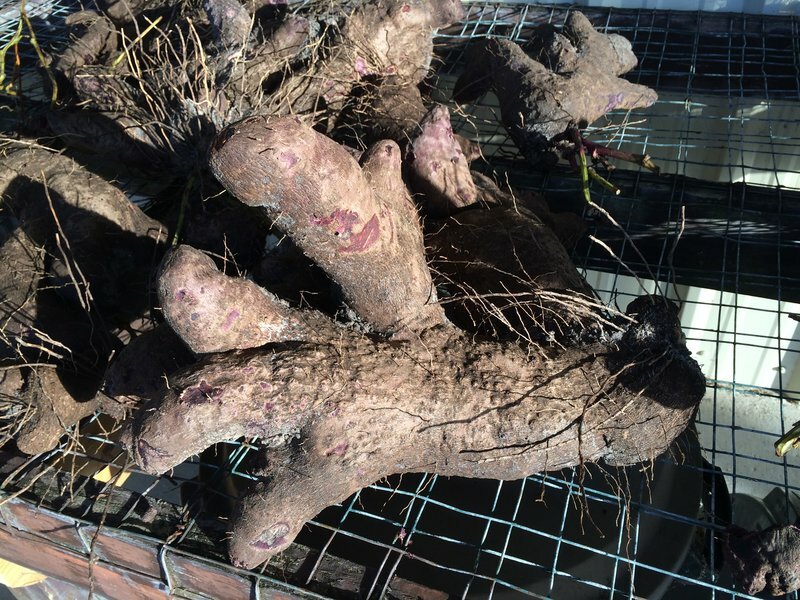 Figure 8: Photo of Diascoria alata (purple variety, ‘Ube’) tubers for propagation. Note the shoots emerging from the tubers. Photo by Larry Yarger. A yam tuber looks very different than a potato tuber. A yam tuber may get up to 2 meters long! Some grow in a cone shape, up to a meter in diameter at the bottom and tapering to the top, and a meter in height from top to bottom. A good yam yield per plant would be 5 to 10 pounds (2 to 5 kg). In competitions, yams have been found to weigh 150 pounds (68 kg) or more; these have been for show, but they demonstrate the yam’s potential to produce a really large storage organ. When a yam is harvested at its normal time (time to maturity varies with variety), the plant will have already gone into dormancy. The foliage may show signs of a disease that tends to occur in the last few weeks of foliage growth. The plant is not sick; rather, the foliage has begun to die back and is vulnerable to attack by fungi. At the same time, the tuber goes dormant for a relatively fixed period of time that varies between species and between varieties. This means that even if yam pieces are planted early, they will not sprout until the season is right. On the other hand, if yams are in storage when the time of dormancy ends, they will start to sprout even though they are not in the ground. The life cycle of yam foliage is linked to the life cycle or dormancy of the tubers. Growth and dormancy times must add up to 12 months, so yams that die back early have a longer dormancy than those that die back later. Some yams can be harvested after 8 months, and tend to be dormant for 4 months. Other yams are harvested at 10 months and stay dormant for just 2. Still other yams have an extremely short dormancy; they take about 11 months to mature in the field and then can only be stored for about a month. The cause of dormancy length is still poorly understood, but may be related to day length. Yam foliage likes to vine. If the plant is not provided with a trellis or something to grow up onto, the tuber yield will suffer. At ECHO’s Global Demonstration Farm in Florida, it grows well in a simulated rainforest clearing, with vines growing on tall stakes. You can recognize Dioscorea species by the leaves, which have parallel veins that tend to converge towards the tip (Fig. 7). This particular vein structure is somewhat rare among flowering plants, but all yam species possess it. The form of the leaves, however, might vary. For example, sometimes the leaves will be divided into three or five lobes. Yam foliage is not eaten (we do not have information about why not; input from those working with small-scale farmers is welcome). Yams are usually eaten boiled, served in pieces or mashed. When used in pieces, yam is often eaten in soups or stews; mashed yam can be used as a thickener or made into cakes and fried. The white yam (D. rotundata), is often cooked and then pounded in a large mortar with a pestle. This makes it into a very flexible gooey paste, which is called fufu throughout West Africa. A portion of fufu is shaped by hand and then used to scoop up sauce during a meal. Other varieties are sometimes pounded in West Africa, but the white West African yam is best for fufu. The tubers can also be cut into thin slices and cooked as chips. Frying tends to produce a bitter flavor, however, and is not suited to all cultivars. Yam flour is usually made from uncooked tubers; the root or tuber is ground and then the ground material is dried. If a yam tuber is cooked first, the material becomes very sticky and difficult to handle. The aroids include two main genera, Colocasia and Xanthosoma. Within these genera, the most well-known species are Colocasia esculenta (taro, cocoyam, eddo and dasheen) and Xanthosoma sagittifolium (tannier, yautia and malanga) Colocasia spp. and Xanthosoma spp. 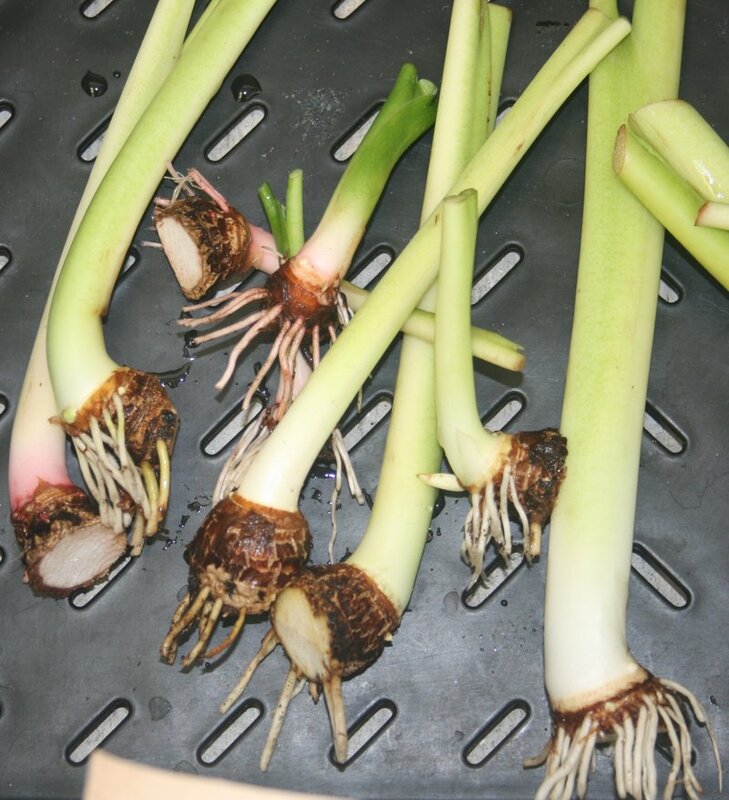 are characterized by ‘elephant-ear’ growth and compact underground stems (technically corms). All yield in much the same way, but otherwise have some significant differences. One Colocasia variety, called the “eddo,” developed in the temperate zone. Around each plant, the eddo has a relatively large number of corms that begin to grow at a very early stage of development out of the bottom the plant, forming a clump. Taro and dasheen are two other Colocasia varieties, both more tropical than eddo. Most taro varieties grow in paddy culture, in flowing water. Taro has one large central corm and a few smaller side corms. Dasheen is an upland taro, grown in non-flooded conditions. Tannier is one of several species of Xanthosoma. Tannier is similar to the eddo in that it produces a lot of side corms that are harvested for eating. The center of the old corm is generally harvested, cut into pieces and used for seed material. All aroids tend to have a similar life cycle, but the growth cycle of the Xanthosoma species are the most predictable. Aroids grow during the rainy season, and mature as the dry season begins. The foliage will begin to weaken but will not completely die back. These crops seem to respond to the environmental stimuli rather than to daylight; you can plant them (Fig. 9) at any time of the year if you can provide the right water conditions, warm temperatures and plenty of sunlight. 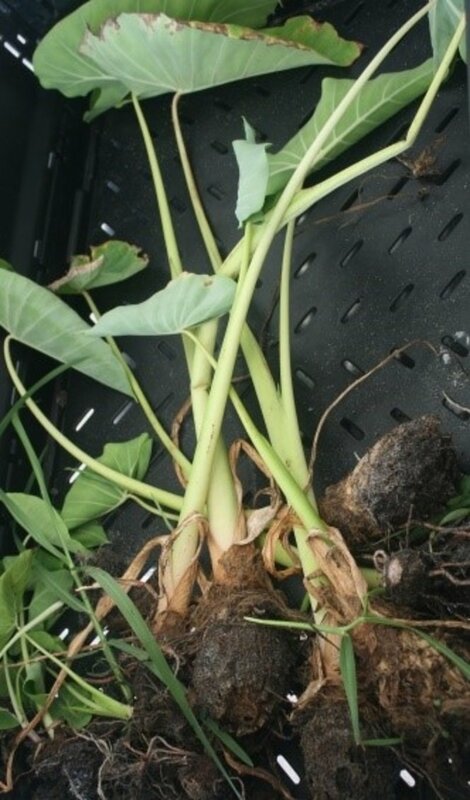 Figure 9: Taro propagation material collected (left) and prepared (right) for planting. Photos by ECHO staff. The eddo is the least flexible in terms of life cycle, perhaps because it was developed in China rather than the tropics. The eddo likely responds to day length and has a yearly cycle that fits into the calendar. Colocasia has a peltate leaf, meaning that the petiole intersects the leaves somewhat below the rear lobes (Fig. 10), and the leaf does not have a well-defined marginal vein. By contrast, a leaf of the genus Xanthosoma has the petiole attached right where the lobes begin at the rear of the leaf, and the marginal vein is apparent. These two characteristics help differentiate between Xanthosoma and Colocasia. Figure 10: Photo of Colocascia (left) and Xanthosoma (right) leaves. Photo by Larry Yarger. The leaves of eddos, dasheens, taros, and tanniers are eaten. Some of them are very good. The leaves start out rolled up within the stem; the best time to harvest them as a vegetable is as they push their way through the stem. The leaves of aroids produce crystals of calcium oxalate. You can actually see these under the microscope. They occur in bundles and can actually stick in your mouth and sting, unless you use only the very young leaves of specific species/varieties and discard the cooking water. Some varieties sting much more than others. The stinging is due to mechanical wounding; while it is unpleasant, it is not poisonous. Compared with other aroids, it has very low calcium oxalate content, although leaves should still be cooked before eating. Leaves and stems are often treated as separate vegetables, with the stems cut into small ½ inch sections so they cook thoroughly---just like you would cook chard or bok choi. If overcooked it becomes mushy, so the stems should be cooked separately since they take longer to cook than the leaves. Do not consume the cooking water. The lower parts of the leafstalks are too tough to eat….In the tropics it will produce leaves year-round. Plants should be divided regularly to keep them vigorous. They will grow in full sun to light shade. Another low-oxalate variety is that of Colocasia esculenta or ‘Celery Stem’ taro, which has edible leafstalks that can be eaten raw much like celery (Toensmeier 2007). The leaves, however, should be cooked 10 to 20 minutes. Toensmeier also notes that the corms of this ‘Celery Stem’ taro are not usually eaten. Aroids can be used to make flours. They have a fine starch that is very easy to digest. The taro grown in the South Pacific is often recommended as a weaning food for all babies, but especially for babies with allergy problems. The taro from the South Pacific is often fermented, a process during which specific organisms aerobically ferment the starch and release sour lactic acid (this fermentation is similar to the fermentation of milk sugar when making yogurt). The resulting sour material is the famous Hawaiian poi, for which most adults have to develop a taste. Any particular location in the tropics may be suitable for some of these tuber crops, but will not be suitable for all of them. They each have different life cycles and varying requirements, especially for water. All of these crops except the eddo and the potato are grown in Puerto Rico; however, they are grown in different locations, with different technology and with differing degrees of success in the same country. In areas where farmers are having difficulty growing cereal grains, conduct a trial evaluating the yield potential of several root and tuber crops. Be open to trying other root crops besides those covered in this document [e.g., jicama (Pachyrhizus erosus; see TN 36 for more information)]. Take advantage of opportunities to grow out and evaluate promising varieties. Traits to look for would include drought tolerance, disease resistance, increased yield, or orange/yellow colored tubers (an indicator of Vitamin A). Recognizing that starches alone do not consitute a complete diet, try growing root and tuber crops in combination with cereal grains, grain legumes and/or vegetables. On ECHO’s Global Demonstration Farm, we saw that a low-growing varietiy of cowpea grew well under the canopy of cassava plants. Sweet potato could be an effective ground cover underneath yam, cassava, or maize. 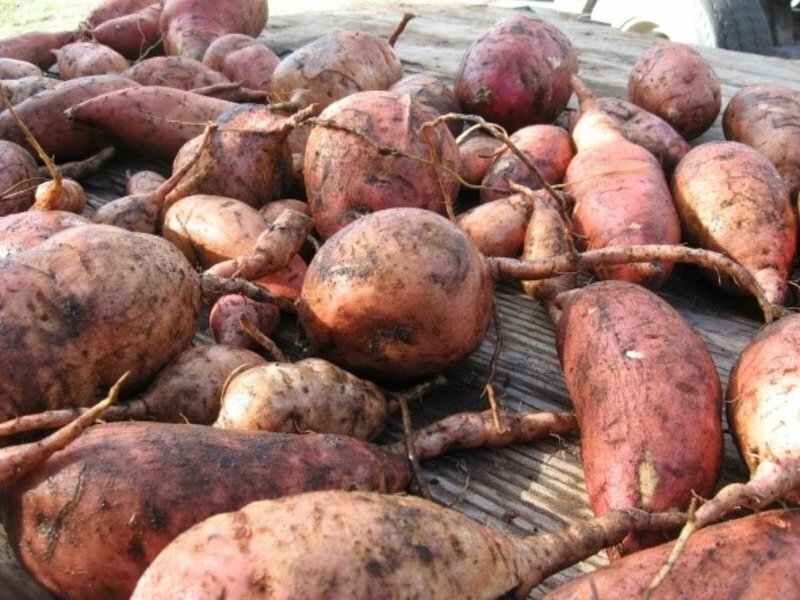 Study ways to improve the storage life of sweet potato and other tuber crops. Focus on technologies that are affordable and that can easily be taught and implemented. This could involve dialogue with farmers to explore ways to extend the storage life of crops by making simple modifications to technologies and practices they are already familiar with. All of the root and tuber crops discussed in this document are good food-cropping options, and each has a special niche in the tropics. Hahn, S.K. 1984. Tropical root crops. Their improvement and utilization. IITA paper presented at Conference on “Advancing Agricultural Production in Africa”; 13-17 February 1984, Arusha, Tanzania. Infonet-biovision. 2012. Sweet potato weevil. (URL: http://www.infonet-biovision.org/default/ct/97/pests). Martin, F.W., R.M. Ruberte, and J.L. Herrera. 1989. The Sweet Potato Cookbook. Dana Beck Fanger Estate Mission Committee, First Presbyterian Church, Dunedin, Florida (check www.echobooks.net for availability at ECHO’s bookstore). Prescott-Allen, R and C Prescott-Allen. 1990. How Many Plants Feed the World? Conservation Biology 4:4, 365-374. Tindall, H.D. 1983. Vegetables in the Tropics. The Macmillan Press Ltd.
Toensmeier, E. 2007. Perennial Vegetables. Chelsea Green Publishing White River Juntion, Vermont (available at ECHO’s bookstore--- www.echobooks.net).